Three layers of lemon cake sandwiched together with raspberry jam and lemon buttercream. 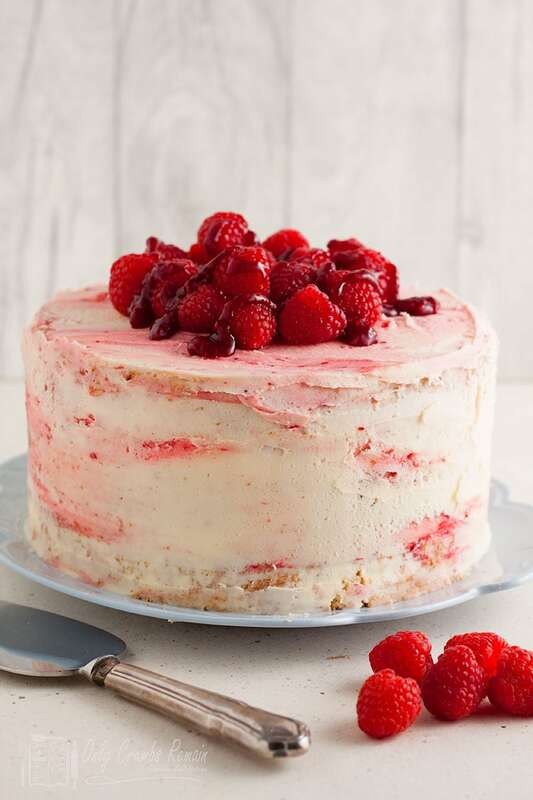 Covered with more buttercream and topped with raspberries, this cake is a real show stopper. I’m celebrating. And what better way to celebrate than with cake! Welcome to my very first post on Only Crumbs Remain. My name is Jacqui and I recently took over the Only Crumbs Remain recipe blog from my friend Angela. Angela started Only Crumbs remain at about the time I started my own blog Recipes Made Easy and we soon became friends as we supported ourselves through our blogging journey. Last year Angela, who is a very talented lady, discovered a love of making ceramics. As a result she reluctantly had to decide to give up the blog because there just are not enough hours in the day to do both. I have already succumbed to buying a few of her lovely ceramics from her Etsy Yorkshire Ceramics Etsy shop . Fast forward to the beginning of this year, I had a chance conversation with another friend, Sabrina about how sad I was that this lovely blog with the fabulous name was soon going to be gone forever. She suggested I took it on and although at first I thought it would be mad to take on a second blog, as anyone who reads Recipes Made Easy knows, I love baking and I decided to see what Angela thought of the idea. I’m delighted to say she thought it a great idea too and so here I am. I am the daughter of a baker and have been a cookery writer for many years. A brief history about my journey from magazines to blogging is on my about page. I am so excited to take on this fabulous blog as I have so many baking and sweet recipes I want to share with you and what better place than a whole blog dedicated to just such recipes. From classic recipes to more contemporary bakes, I love sharing my love of baking. My plan is to keep almost all of Angela’s recipes and to add my own on a weekly basis to build a really comprehensive site full of new and classic, sweet and savoury bakes. The first stop whenever you want to bake. Angela posted on a web platform called blogger and I transferred it over to WordPress which I use for Recipes Made Easy. For the last few weeks, I have been working on the nuts and bolts of the blog to give it a whole new look. I hope those of you who knew the Old Only Crumbs Remain will like the changes. Over time I will be generally updating the posts so they all fully fit with the style Only Crumbs Remain. In the meantime some of the recipes are not in Recipe Cards, a bit of software which makes them stand out more but also give you the functionality of being easy to print etc. My priority will be putting all the recipes into cards as soon as I can and I hope you will bear with me while this is done. But no one wants to spend all their time at their desk, so I shall be in the kitchen baking and sharing a new recipe with you each week as well as working on Recipes Made Easy. Which brings me to where I am now, celebrating because while not all of the back end work is done yet , it is time for my first recipe and I hope you like it. This lemon and raspberry layer cake is basically a pimped up Victoria sandwich. For the cake itself I’ve used a classic Victoria sandwich mixture flavoured with lemon zest and juice. As its a celebration, I have decided to add an extra layer. The layers are sandwiched together with a layer of raspberry jam and lemon buttercream. Now, much as I love buttercream I do find that sometimes it can make a cake far too sweet. To avoid this I have counteracted the sweetness by making the jam especially for this cake. This “jam” has a lot less sugar than usual, and a much fruity and sharper flavour. However, it will not keep as long as a traditional jam. That said, any leftovers – and you probably will not use it all – can be stored in the refrigerator for about a week. It’s yummy on bread or drizzled over ice cream or yogurt. You can make the jam with fresh or frozen raspberries. I used frozen for the jam as they tend to be cheaper and fresh ones on the top to decorate. The buttercream itself is flavoured with some lemon juice, zest and lemon curd giving it just the right amount of lemony tang. Beat the butter and sugar together until very pale and creamy. Divide the cake mixture between 3 tins and level the surface. Bake until springy to the touch. Transfer to a wire rack to cool. Beat the butter until soft and creamy. Beat in half the icing sugar. Beat in the lemon juice, zest and curd followed by the remaining icing sugar, beat until creamy. Spread the jam over one of the cakes, right up to the edges. Spread butter cream over another cake. Place the buttercreamed cake upside down on the first and spread with more jam. repeat with the remaining cake. Thinly coat the side of the cakes with buttercream. Spread some over the top and dot with a little jam. Spread to cover the top completely. Smooth the top of the cake to give a marbled effect. Decorate with fresh raspberries drizzled with a little jam. Three layers of lemon cake sandwiched together with raspberry jam and lemon buttercream. Covered with more buttercream and topped with raspberries this cake is a real show stopper. Preheat the oven to 190℃ (170℃ fan)/375°F/gas mark 5. Lightly grease and line the base of 3 x 18cm (7in) sandwich tins. Beat together the butter and sugar until the mixture is very pale and creamy. Gradually add the egg beating well after each addition. If the mixture begins to curdle beat in a little flour with the egg. Beat in the lemon juice and zest, then carefully fold in the flour. Divide the mixture equally between the prepared tins and level the surface. Bake in the centre of the oven for 20 to 25 minutes until pale golden and springy to the touch. Turn out and cool on a wire rack to cool completely. Place the raspberries, sugar and lemon juice in a saucepan and heat gently stirring until the sugar dissolves. Increase the heat and boil rapidly for about 5 minutes until reduced and thickened slightly. Allow to cool completely. Beat the butter until softened then beat in about half the icing sugar. Add the lemon zest, juice and lemon curd and beat to combine. then add the remaining icing sugar. Beat until light and fluffy. Spread a generous layer of jam over one of the cakes and buttercream over another turn the buttercream cake upside down and place on top of the jam. Repeat with the remaining cakes. Spread a thin layer buttercream around the sides of the cake. Roughly spread the remaining buttercream over the top of the cake. Dot with a little jam and spread level to give a marbled effect. Pile some fresh raspberries onto the top of the cake and drizzle with a little more of the jam. If you do not have 3 tins you can save one third of the mixture and cook two. As soon as they are cooked transfer to a wire rack. Wash, dry and grease one of the tins and add the remaining mixture and cook. Spread the jam right up to the edge of the cake so that some combines with the buttercream when covering the sides. Save money by using frozen raspberries for the jam. Why not subscribe and receive an email every time there is a new post. Or follow me on Instagram, Twitter and Facebook. If you make any of my recipes recipe I would love to see your pics tag me. What a gorgeous looking cake! Loving the new look of the site too! Thank youKat. Im enjoying working on it so much. That’s great you are taking over. It must be really interesting taking over a blog that has already a lot of content and having a lot of blogging experience – so different from being a newbie blogger. Good luck with it. And your cake looks beautiful. Thanks Joanna. It’s certainly interesting taking over an existing blog very different from starting from scratch but it also brings its new challenges. Thank you Eb, It all seems to have happened quite fast I must admit but still a ton to do not least get all the recipes into recipe cards. It’s a gorgeous cake Jacqui! It would be perfect for any kind of spring/summer celebration. I love the new look too! Wow, this is gorgeous, and I love the simple styling of this cake, Thank you for bringing it to #CookBlogShare! This is so gorgeous! I love how you frosted it too – it looks beautiful! Thanks Cat Im looking forward to growing the blog. Thank you so much for your kind words Jenny. Congratulations on your first post at OCR, and to Angela for her new venture! What absolutely GORGEOUS pictures! The step-by-step is so helpful. I can’t wait to dive face-first into this cake! Thank you Michelle I will be including more step by step pictures with the new recipes. And what a fantastic recipe to celebrate the beginning of another chapter of your blogging journey Jacqui! With your baking expertise I really couldn’t think of better person to carry on what Angela has started! Thanks Jo Im looking forward to taking part in your linky more often now. I totally agree about lemon and raspberry as a flavour combo I love it. I absolutely love the look of this cake. Raspberries are my favourites and you have made them even better. Thanks Janice yes raspberries are a fav of mine too which is why i have quite a few raspberry canes on my little allotment plot. Roll on Summer!